Robert Lewis, Town Hall recreation director, gave this report on Town Hall Youth Basketball. On Tuesday, Jan. 15, the Idyology Celtics played the Village Market Clippers. The Clippers had only four players, due to other players being sick, but Ashlyn Wilkerson played good defense and grabbed many rebounds. Tate Donovan had 8 points for the Clippers as they shut out the Celtics 20-0. In the second game, the American Legion Lakers went up against the Idyllwild Pizza Co. Raptors. Kaylee Gage of the Lakers had a great game with 7 points, but Rory Lovet Jensen countered with 18 points as the Raptors beat the Lakers 18-13. On Friday, Jan. 18, the American Legion Lakers hosted the Village Market Clippers. Riley Smith had 12 points for the Lakers and Orion Colinson had 8 points for the Clippers, but the Lakers held on for 22-12 point win over the Clippers. The second game had the Idyllwild Pizza Co. Raptors against the Idyology Celtics. Beau Dillon played great defense and dribbled the ball very well for the Celtics, however, Tristian Bilecky had 4 points as the Raptors beat the Celtics 22-6. Tuesday, Jan. 22, had the Idyology Celtics going against the American Legion Lakers. Darius Esparza had the hot hand for the Celtics with 10 points. Ethan Catro had a good game with his hustle and defense, but wasn’t enough as the Celtics downed the Lakers 12-8. The nightcap had the Village Market Clippers against the Idyllwild Pizza Co. Raptors. Quinten Hoggan had 2 points for the Raptors and Lucy Newman had a good game for the Clippers, but it wasn’t enough as the Raptors beat the Clippers 23-4. On opening night, Jan. 17, the season opened up with the Idyology Kings playing the Higher Grounds Coffee House Lakers. This game came down to the wire with Dane Mock scoring 16 points for the Kings. Ethan Sheppard had a great game with 13 points, including 4 in the fourth quarter as the Lakers squeezed by the Kings 23-22. In the second game, the Acumen Tree Service Warriors played the Village Market Rockets. Finn Carpenter had 6 points for the Warriors, but Cody Fogle was hot with 24 points for the Rockets as they beat the Warriors 30-22. On Friday, Jan. 18, the Acumen Tree Service Warriors fought against the Idyology Kings. Griffin Krestinger had 9 points for the Warriors. Tyler Reeves had 6 points for the Kings, but it wasn’t enough as the Warriors beat the Kings 23-11. In the nightcap, Village Market played Higher Grounds Coffee House. Oliver Gonzalez played very good for the Lakers with 5 points, but the Rockets countered back with 4 points from Tara Geisinger and had many rebounds as the Rockets held on with a 26-21 victory against the Lakers. On Thursday, Jan 24, Higher Grounds Coffee House Lakers visited the Acumen Tree Service Warriors. It was a good close game with Skyler Kramer pouring in 12 points for the Warriors. Christian Gonzalez chipped in 4 points as the Lakers beat the Warriors 21-16. The second game had the Idyology Kings hosting the Village Market Rockets. Cole Kenyon had the hot hand for the Rockets with 11 points, but the Kings got 6 points from Mecino Reynosa as the Kings got their first win of the year beating the Rockets 29-20. Race for first place tightens with two weeks left before playoffs. • Idyllwild Brewpub defeated Idyllwild Garage in a close, five-set match 25-20, 21-25, 25-19, 19-25 and 15-10. 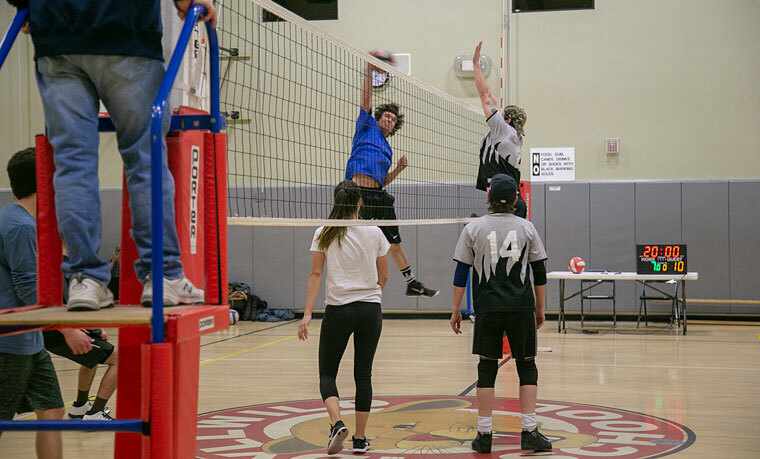 • Wilson Woodworking defeated Idyllwild Garage 18-25, 25-11, 25-16 and 25-10, and Silver Pines Lodge 25-21, 25-19 and 25-23. Playoffs are on Saturday, Feb. 16.